Radical right parties have seen increasing electoral success throughout Europe. What does this imply for parties and party systems? Do established mainstream parties adjust their policy positions in response to successful radical right parties? If yes, is this ‘contagious effect’ restricted to specific party families or is this an overall trend within European politics? Tarik Abou-Chadi and Werner Krause investigate these questions and find that mainstream parties adjust their policy strategies when confronted with a successful radical right challenger and shift toward more anti-immigrant positions. Using a novel research design, they can demonstrate that these shifts are not just a response to changing public opinion but can be causally attributed to the success of the radical right. Europe’s political discourse has seen a tremendous shift during past decades. While questions of immigration for a long time did not play a big role politically and were mostly regarded through an economic lens, European governments now increasingly tighten migration laws and demand cultural assimilation from immigrants. Moreover, public debates increasingly ask for the preservation of national values that are supposedly put in danger by increasing immigration rates. Interestingly thus, while public attitudes toward immigration have not become more hostile in the past 15 years, public discourse, political campaigns and immigration legislation have become more culturally right-wing than they have been in a long time in Europe. Is the radical right ‘contagious’? There seems to be increasing support for the idea that this right-ward shift is related to the rise of right-wing populist parties. Certainly, the emergence and success of new radical right parties has challenged and transformed the party systems of Western Europe and beyond. After the 2017 German federal election, for example, political parties from the centre-left and the centre-right highlighted that the entrance of the AfD into the German Bundestag represents a watershed moment in recent German history. For instance, Manuela Schwesig – prime minister of Mecklenburg-Vorpommern and vice-chair of the SPD – declared that the AfD ‘will not only change the Bundestag, but the entire country’. Politicians of the CDU and CSU (amongst them Chancellor Angela Merkel) repeatedly announced that one of the parties‘ main tasks will it be to win back voters lost to AfD. Seen from this angle, recent right-ward shifts within West European party systems may indeed have been caused by the rise of radical right challengers. However, this perspective runs into the risk to attribute the radical right greater importance than it deserves. While there is little doubt that immigration has become a salient political issue in most European democracies, some recent academic studies argue that this development cannot be attributed to the success of the radical right. This reasoning partly rests on the observation that in some countries mainstream parties started competing on immigration-related issues even before there was a successful radical right party. Looking again at the German case, this idea does not seem implausible. Leading personnel of the CDU has repeatedly and prior to the success of the AfD initiated culturally centred debates that have highlighted the presumed need to preserve ‘German values and habits’. For instance, Berlin’s then Senator of the Interior, Jörg Schönbohm (CDU), demanded in 1998 that immigrants need to respect the German Leitkultur – a monocultural vision of German society coupled with the demand for immigrants‘ cultural assimilation. Similarly, the Dutch CDA and VVD started politicising immigration issues already in the 1990s, long before the political breakthrough of the infamous Pim Fortuyn. Hence, while several studies have found an association between radical right success and the behaviour of established parties, we cannot say for sure that this behaviour is indeed in reaction to the radical right or a mere a by-product of a general right-turn in Europe. We have investigated this problem in a recent publication in the British Journal of Political Science by asking whether successful radical right parties indeed cause established mainstream parties to take tougher stances on immigration. Without going into detail, we employ a regression discontinuity design (to learn more about it, see the excellent article by Lee and Lemieux) to tackle this question. 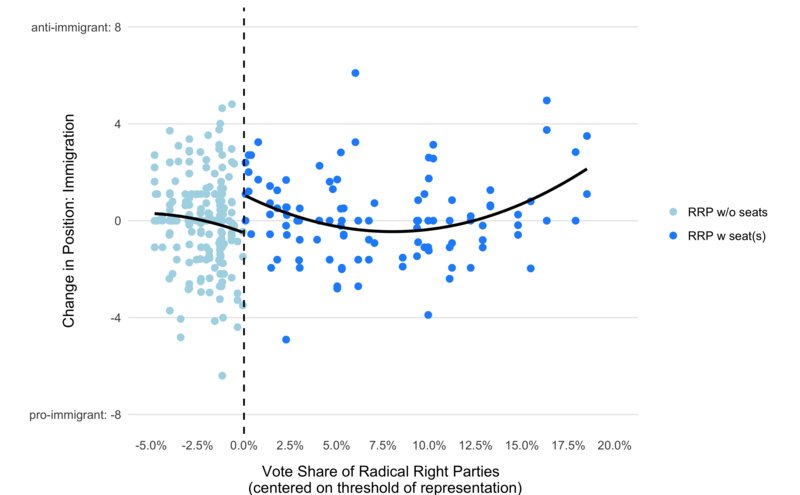 The basic idea of our article is to exploit national election thresholds to see whether mainstream parties respond to the rise of the radical right. We thus compare mainstream parties‘ shifts in positions on immigration (estimated based on the MARPOR dataset) where radical right parties have missed to enter the national parliament with those positions where far right challengers successfully gained seats. To give an example: all electoral systems have an implicit or explicit election threshold specifying how many votes a party needs to win in order to gain at least one seat. For instance, Greek parties are required to win at least 3% of the national vote to enter the Hellenic Parliament. In terms of public opinion, it will make little difference for established parties if a radical right party gains 2.9% or 3.1% of the national vote. However, in the latter case the radical right challenger enters the parliament. Parliamentary representation provides radical right parties with additional resources and media attention which increases the threat that they constitute for established parties. If established parties do respond to the threat of the radical right and not merely to shifts in public opinion, we will see a stronger shift in those cases where the radical right just made it into parliament. The figure below illustrates this effect. The light blue dots show shifts in mainstream party positions on immigration if a radical right party has not gained parliamentary representation. The darker dots represent positions when radical right parties managed to gain seats. Importantly, we are interested in the jump between the two lines. This gap indicates that mainstream parties indeed promote – on average – more restrictive positions on immigration if a radical right challenger enters the national parliament. In our article we test this relationship with more sophisticated statistical methods. The results confirm the first visual impression: Mainstream parties promote more restrictive stances on immigration when they are threatened by the radical right in parliament. Importantly, we find this effect for centre-right and centre-left parties. Radical right parties’ electoral successes are, thus, not only a symptom or by-product of the ‘right turn’ in European democracies, but a factor contributing to this development. Our findings thus speak against the idea that the recent anti-immigrant shift in European politics is simply an adjustment of positions and policies to the demands of the electorate. While many journalists, pundits and academics seem to argue that the current shift is a democratically desirable process of representation, our findings indicate that it is much more a strategic decision of political parties striving to increase their vote share and weaken their challengers. Looking at the more long-term developments in Western Europe, it seems doubtful that this strategy is actually working. While mainstream parties have significantly shifted to the right on questions of immigration and national identity in countries such as Austria, Denmark or the Netherlands, radical right parties seem to be doing better than they ever have. Hence, it remains an unanswered question whether established parties indeed successfully diminish electoral support for the radical right by adapting their positions or whether they rather risk shifting political debates increasingly toward more anti-immigrant stances and thereby in the long run legitimise the rhetoric and discourse of the radical right. This article represents the views of the authors and not those of Democratic Audit. It was first published on WZB Democracy blog and is republished with permission from the authors. The regression discontinuity design is a close relative to a randomized experiment. The basic idea is to exploit a quasi-random assignment of treatment at a cut-off point. In our case, we can exploit the fact that around the threshold of representation depending on the electoral system parties with similar vote shares will end up inside or outside parliament. Tarik Abou-Chadi is assistant professor at the department of political science at the University of Zurich and the Centre for Democracy Studies Aarau. His research focuses on elections, party competition, and political change. He is currently working on a project investigating the transformation of political competition in post-industrial societies. Werner Krause has been a research fellow at the WZB Berlin Social Science Center (research unit Democracy and Democratization) since 2016. In his dissertation, he studies how political competition affects the electoral success and failure of radical parties in Western Europe. His main research interests include political competition, radical right and radical left parties, comparative political behaviour and quantitative methods.